Every morning is an oatmeal morning with Grandpa. 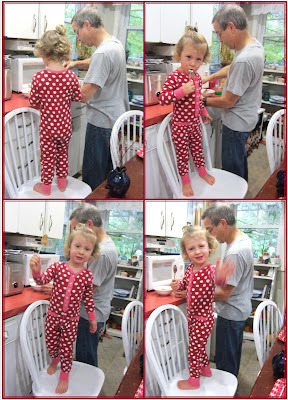 EJ scoots her chair over and helps him prepare a bowl for each of them. Her help mostly involves getting tastes of the peanut butter, dried cherries and cranberries as they go in, but she still considers it help. I'm thankful for a worry free meal that is a healthy start to her day and nobody makes it better than Grandpa!